Today there are those who treat the AIDS crisis as if it were a factor in the past, giving up as warriors in the battle against it, as crucial volunteers and activists. Those tiring of the life-draining struggle demanded by this world-wide tragedy are giving rise to an unexpected generation of newcomers, called endangered ostriches by some observers. Therefore, the energies of women and men with a heightened AIDS awareness at their disposals are more needed now than ever before. As many survivors have believed since early days of the plague, statistics about its frequency were long being grossly underestimated. And, because of fundamentalist religious influences at work in the Reagan Administration, AIDS was lied about and treated as a minority concern. 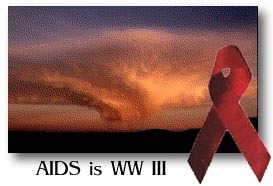 The news that AIDS IS WORLD WAR III—has not, therefore, truly hit home. If most have simply yawned, recent United Nations reports showing a doubling of worldwide HIV infections should be reason enough to wake them up for positioning in crucial AIDS-ward foxholes on the battlefronts. Some day, if not now, AIDS warriors will know immense personal satisfactions experienced for having taken part in late century AIDS militias. ACT UP is already legendary for its early exploits. Such men and women, if they're re-incarnated as AIDS activists in the current generation, have ample reason to believe they're struggling against the one true enemy in our times. Previously, 8,000 new HIV+ cases per day were reported worldwide. That figure has been—as they say—"revised upward":100%. Now, according to a United Nations report issued last week, 16,000 persons per day are becoming HIV-positive. This is a tragedy of monumental proportions. Some media moguls assist self-righteous turncoats in their plan that turns virtual guns on people with AIDS by damning them as heirs to a pleasured, nay, even a good life as pampered recipients of the state's generosities. This vicious focus, seized upon happily by fundamentalist fanatics, is suicidal. Where is World War III style media when such vicious traitors as these mislead? In 1997, 5.8 million people contracted AIDS, more than a half-million children. Since there is no reason to doubt why current demographics will not hold, the year 2000 promises to host 40 million people with full-blown AIDS or who will test HIV-positive. Only a short time ago, AIDS researchers once again seemed to offer hope, touting new classes of drugs, magic bullets— or AIDS "cocktail" drugs. Now, there has been what others are calling "a reality check." Dr. David Ho, director of the Aaron Diamond AIDS Research Center in New York, says, "Invariably, the resistance problem (to the cocktail drugs) is going to get worse." Some in the ranks of the AIDS brigades, think that a proper re-routing of dramatic media focus on the plight of the millions of people with AIDS itself could do more than any other strategy to curb both extremes of careless social excess as well as obvious signs of government apathy, hurrying action by demanding not just vaccines, but a cure. "The struggle against AIDS mustn't become a lucrative business like cancer," they argue, "because this is an international emergency and it already threatens to kill as many as died in World War II—and more. We've got to work overtime to get this important news angle into circulation: AIDS is World War III." One out of every 100 sexually active adults in the world is now living with HIV. Dr. Peter Piot, who directs UNAIDS at the U.N., says, "The more we know about the AIDS epidemic, the worse it appears to be." In 1997, thus far, 2.3 million world citizens have died of AIDS. Where is the quilt that can accommodate so many names? The media has a serious job to do, one of relentless AIDS education and brazen critiques of government inaction, if it continues. And Hollywood must more vigorously rise to the solemn occasion too, as happened in the 1940s during World War II, when movie moguls supported the allied war effort against fascist invaders. Politicians and pretentious religious fanatics who stand in the way of life-preserving clean-needle exchanges, condoms, and other proven protective devices today would have been, in another era, classed with war criminals and traitors. These traitors to their fellows, masquerading as leaders, refuse to provide them with weaponry against devastating alien invaders, the killer viruses. Some believe that the AIDS virus has been deliberately spread by cohorts of these same political hacks. (See GayToday's continuing series on AIDS). It is now obvious to all but the most benighted religious fundamentalists that the struggle against AIDS is a boon to all humanity, not to homosexuals alone. It is not even just an AIDS struggle. World health and sustainable life itself are hanging in the balance. Economies worldwide hang in the balance. The struggle against AIDS is about affirming personal Life and Peace as they move within us to overcome Death and Destruction. Every citizen must arm himself or herself with a wide range of perspectives, a range far beyond that of those moneyed power-mongers who ignore the plight of people with AIDS and hope thereby to destroy them. "There is no them," when it comes to AIDS, reminds one activist, "there is only us."